I have really been enjoying the non-fiction books I have read so far in my Year of Reading Buechner, but this month I turned my eye to one of Buechner’s fiction books. I have been eager to read Brendan: A Novel, for a couple of reasons. One, because a few years ago I read and really enjoyed Son of Laughter, his fictional account of the life of the Biblical patriarch, Jacob; and secondly, because this book was all about one of my favourite people from the Early Middle Ages: Brendan the Navigator. Brendan was published in 1987, and won the Christianity and Literature Belles Lettres Prize that year. As I mentioned, it is the fictional account of the life of the 6th century Irish saint, Brendan the Navigator, whose story of adventures and miracles encountered during a sea voyage with fellow monks was one of the most popular stories in medieval times. The tale is told from the point of view of Finn, Brendan’s companion and best friend, and is set in a realistically dark and dirty sixth century Ireland. Brendan is no polished saint in this book, in fact far from it. Finn is a nominal Christian at best, and he casts a skeptical eye on some of Brendan’s tales, because he knows how much Brendan loves to embellish the truth. But there are times when Finn sees Bren performing a miracle himself, and is unable to explain away the occurrence except as a miracle. There is a great tension in this book between truth and lies; faith and doubt. Brendan himself struggles between these dichotomies. He makes his way with great self-confidence at times, but at others he is racked by doubts. This novel does not allow you to think of him as a saint in the way we normally think of them, as people who are so advanced in holiness that they have left us behind in the dust. I love the way Buechner portrays the people of sixth century Ireland in this book. They feel like real people. And I appreciate they way he shows how Christianity met and mixed with the old religions that the Irish Celts practiced. Even Brendan himself, when sent to pray in a cave overnight as penance by the Abbot Jarlath, also turns to the Celtic god Dagda. He knew it was the one and only true God he was supposed to call on for mercy but he thought it would do no harm to call on the Dagda as well. He only whispered his name in his heart instead of speaking it out loud though. The last thing in the world he wanted was for the Dagda to turn up there in the cave lugging his terrible great club and his brass cauldron. All the boy was after from him was a bit of luck. And when Brendan sets off on his voyage, he does so in order to reach Tir-na-nog, a kind of earthly Paradise, the land of the young, where the gods of the Irish Celts lived. It eventually morphed into the idea of the Otherworld, the land of the Elves. These tales abounded in Celtic folklore, but it is not exactly a kosher concept from a Christian point of view. But this was an age where the old beliefs were meeting head-on with the new, so this juxtaposition of pagan and Christian is very realistic for the times.The Navigatio Sancti Brendani Abbatis (The Voyage of Saint Brendan the Navigator), the medieval manuscript that details Brendan’s voyage, says that Brendan was trying to reach the Promised Land of the Saints. The idea is of an earthly Paradise, such as the Garden of Eden. The stories of Tir-na-nog could certainly have been meshed with that idea, in the minds of Celts who are new to the faith. So I like this insertion into the book, although it is not strictly true to the stories of Brendan. There is also quite a bit of comedy in this book. The “holy fool” is a theme you find often in Buechner’s writings, and in this book Brendan takes on that role. He is a braggart, full of wild tales and exaggerations; and odd-looking, with his mis-matched teeth, pointy head, and large derrière. He stumbles through this book, at times serenely performing miracles and at others cowering in unbelief and doubt. And so in this way Buechner makes a larger-than-life saint a person we can relate to. Other characters also have their comedic moments. Finn himself is cheated out of going on Brendan’s first voyage because as they set sail a sudden squall comes up and he falls out of the boat, the others not noticing in the dark. In the Navigatio Sancti Brendani Abbatis (The Voyage of Saint Brendan the Navigator), the medieval manuscript that details Brendan’s voyage, the saint only takes one voyage, but in Buechner’s book, he divides it into two. Finn accompanies Brendan on the second voyage, and finds both miracles and heartache along the way. In the end, we are again left with uncertainty about exactly what they encountered, and where, and how much was truth, and how much exaggeration. An illustration from the Navigatio from a 14th century manuscript. It shows one of the stories in the tale, of Brendan and his monks staying on an island which they later discover is actually the great whale Jasconius. Image from Wikicommons. Many of the other famous people from this time appear in this book, such as Saint Brigid, and Saint Malo. I particularly like the appearance of Gildas in this book, near the end, after Brendan is back from his voyages and goes away to Wales to escape his fame. Gildas is a sour and bitter monk, which actually kind of fits the work for which he is best known today, called De Excidio et Conquestu Britanniae (On the Ruin and Conquest of Britain), in which he details the many sins and failing of kings and churchmen alike. He spent his days in his hut with a quill in his hand scratching out on his parchment the nastiness of his times. But through Gildas, Brendan gets to meet the great king, Artor, an old man now, still serving as king at Caerlon. Brendan and Finn go to meet him, as Brendan wants to bring him God’s peace after he hears the tale of the betrayal of his queen Gwenhwyfar and the child Artor had with his half-sister. Finn doesn’t hear what Brendan says to Artor, but Artor is grateful for his visit. As they leave Caerlon, the small, wizened figure of the king stands at the battlements, his hands raised over his head in farewell. I pictured him standing there all the rest of the day and the night as well with his arms in the air and his beard blowing. If I went back in a thousand years it wouldn’t surprise me to find him standing there yet if there’s anything left standing by then in the world. I love this picture of King Arthur, watching over Britain throughout the ages. During a conversation with Gildas, as Brendan reflects on this voyages and expresses the fear that perhaps he had missed the point of what God had called him to do, it comes out in the conversation that the old monk only has one leg. Gildas with but one leg. Brendan sure he’d misspent his whole life entirely. Me that had left my wife to follow him and buried our only boy. The truth of what Brendan said stopped all our mouths. We was cripples all of us. For a moment or two there was no sound but the bees. This book comes at you sideways. It is a window into the life and times of Brendan, well-researched and imaginative. But it’s more than that, too. Brendan’s voyages, both physical and spiritual, mirror our own voyages through life, with their ups and downs, their triumphs and tragedies. The book contains many treasures, but not all of them are ones that you find along the surface. It forces you to dig deep and ponder a little bit. Not a bad thing, nowadays. The New York Times Book Review called Brendan: A Novel, “Strikingly convincing…sinewy and lyrical.” I agree. There is a lot that is earthy in this novel, but at times it will take your breath away. It reminds me a lot of Son of Laughter in that way. It took me a few chapters to get into it, but by the end I knew it was one I would have to read again. Repost: To Lent, or not to Lent? Note: I originally published this in 2015, in the first year of my blog, and it didn’t get a lot of traffic. As we have just begun Lent, I thought this post would fit in nicely this week. It explains one of the key controversies in Northumbria in the 7th century. I hope you enjoy! However, they were cut off from Rome, and their practice of the faith began to take on a decidedly Celtic feel. The Irish and British priests and Bishops still venerated the Roman pope, but in all practicality their allegiances were much more tribal, and the Abbots of the monastery had more sway in spiritual matters than the Bishops of the dioceses. In some cases, the Abbot was both Abbot and Bishop. The Abbots were often descended from ruling Irish families, and held great influence over their people. The practice of the faith was very much centred around the monasteries, as opposed to the diocesan, urban model developed in Rome. Due to their influence, the monastic lifestyle was held up as the ideal of Christian living in the Celtic church. There are many seeds that an author can point to that lead to an idea for a book. Looking back I can identify quite a few that led to my fantasy trilogy, The Traveller’s Path. Without a doubt one of those was planted on a summer’s day in 1987 when I saw the Lindisfarne Gospels in person for the first time. My husband and I were spending a glorious summer travelling through Europe. We began our travels in Britain – I have relatives there whom I had not seen for over a decade, who live in Wales. But before we got there we spent three or four days in London (which is truly one of my most favourite cities in the world). One of our first stops was the British Museum. We are both history buffs and we couldn’t wait to see the treasures there. And indeed we found treasures galore, too many to mention here, but I could write tomes about them all. A happy, happy place for us! Towards the end of the day, after we had wandered through the Egyptian exhibits (mummies! Book of the Dead!) and the Ancient Cultures (Nebuchanezzer! Treasures from Ur!!) and the Greek rooms (Pantheon Friezes!) we saw that there was a section of the museum called the British Library (this is housed in its own building now, separate from the Museum, but at that time it was part of the Museum itself). Being book lovers as well as history buffs we figured we should go have a quick look around. Walking into the exhibit rooms the first thing we saw displayed was a large glass cabinet, with a big book open inside: the Lindisfarne Gospels. I had never heard of this book before, but I was immediately captured by the sheer beauty of the thing. It was the first illuminated manuscript I had seen in person, and the details and exquisite craftsmanship absolutely stunned me. The first page of the Gospel of Matthew, consisting of the first sentence (in Latin): “Liber generationis Iesu Christi filii David filii Abraham” (The book of the generation of Jesus Christ, the son of David, the son of Abraham.) The letters on the side are the Old English translation, added 250 years after the Gospels were finished. A detail from the second initial page from St. Matthew’s Gospel. You can see Aldred’s gloss of Old English up at the top, the rest of the page is one of the few places in the Gospels where you can see Eadfrith’s script free of the gloss and admire the beauty of his lettering. The page consists of instructions on which passages of the Gospel of St. John should be read on specific feast days. Best guess for when the book was finished is 698 AD, as part of the celebrations at Lindisfarne of the translation of St. Cuthbert’s relics to the high altar of Lindisfarne. Cuthbert was one of Lindisfarne’s most famous abbots. Other scholars place the date of completion around 710-720 AD. it is a compilation of the four Gospels (Matthew, Mark, Luke and John), in Latin, from the Latin Vulgate. It was written on vellum, the very finest calfskin available, and it would have taken 300 cattle to make the book. The pigments used were from local sources (ores, lead, etc) but possibly also some lapis lazuli from the foothills of the Himalayas. The translation of the Latin into Old English (Anglo-Saxon) was done by Aldred, a priest, 250 years after its creation. Aldred also added a colophon in which he gives some of the history of the book’s creation. The artist/scribe used lead point (the forerunner of the pencil) to do preliminary drawings on the back of the page, using compasses and dividers as well, and then backlit the pages in some way, perhaps using a transparent horn desk found in the Islamic territories. He then traced the design on the front and painted it. In some cases he deviated from the design he originally drew, obviously struck by inspiration as he worked. It was bound together and given a jewelled cover; the original was lost, unfortunately, but it was given a new cover in 1852. It was taken by the monks from Lindisfarne during the era of the Viking attacks, and preserved by them until the Dissolution of the Monasteries in the 1500s. It’s history is murky after that, but somehow it ends up in the collections of Sir Robert Cotton in the 1800s, who collected many early Anglo-Saxon manuscripts and whose collection formed the basis of the British Library. It is the work of one man, likely Eadfrith, the Bishop of Lindisfarne at the time. Go back and look at the second image for a moment, and think of Eadfirith, in the scriptorium at Lindisfarne, likely cold and drafty with its open windows to let in the light. He is the Bishop, busy with the administration of this monastery, and aside from his duties as Bishop, like all the monks he participates in the rhythm of monastery life: eight times during the day and night to drop everything to attend the services of the Divine Office, plus doing the work of the monastery such as tending the livestock, brewing ale, etc, plus time for study and contemplation. Think of the concentration necessary to do such fine, detailed work, and the planning that was needed to develop the designs. 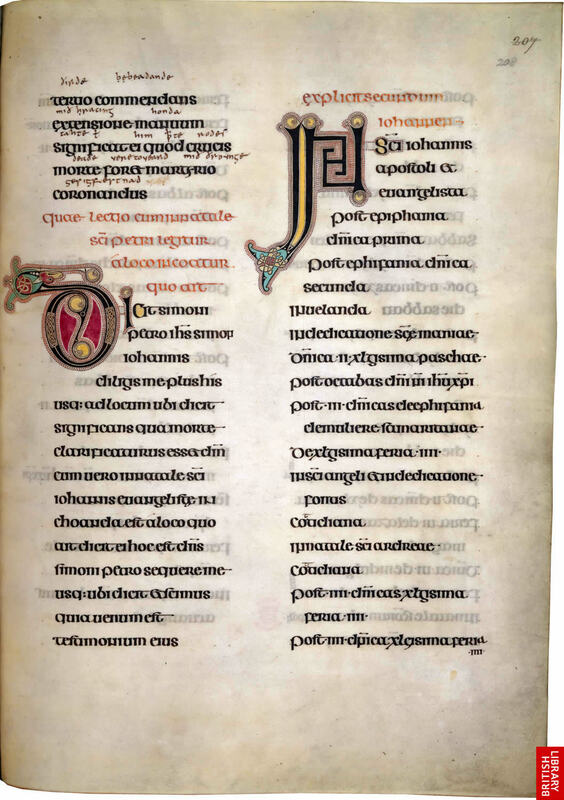 Other Gospel books, such as the Book of Kells, were the work of a team of scribes. Eadfrith was the lone creator of this one, a fact attested to by Aldred’s colophon as well as careful analysis of the writing and art contained within it. It is estimated that someone today, working two years full time with electric light and heating, could make something similar, but not up to the standard displayed here. It likely took Eadfrith approximately ten years to complete the Gospels. It’s an incredible, unbelievable achievement. Eadfrith would have begun each session dedicating his work to God, for this was truly an Opus Dei, a work of God. He would have seen every stroke as part of a prayer he was offering on his behalf and on the behalf of the community at large, each word a “wound on Satan’s body”, according to the Roman monastic founder Cassiodorius, whose works would have been very familiar to the monks at Lindisfarne. Looking at the Gospels I was struck by the devotion and dedication of this man, and I began to wonder what it was like to create this, what spurred him on to do it, how he accomplished it. Those questions lay buried in my mind for twenty years until a few other seeds came together and began to take root and grow into Wilding, Book One of The Traveller’s Path. I knew that I had to include Lindisfarne, and those monks, in my book. 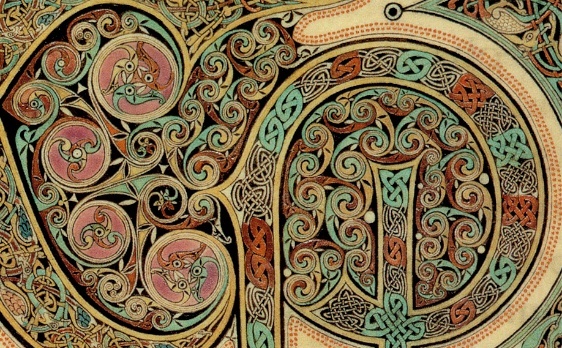 As it turned out Eadfrith himself isn’t in the book, as Wilding takes place (mainly) in 642 AD, but his incredible workmanship displayed in the Lindisfarne Gospels was a huge creative inspiration to me as well as a spiritual one. Eadfrith died in 721 AD. If you accept the later date of the Gospel’s completion, it would mean he died shortly before it was finished. And indeed, there are places in the book where the drawings are unfinished, where paint was obviously meant to be added but was left undone. I can’t imagine Eadfrith not finishing it if he was at all able to do so, so I can see that the reason why it was left undone was that he died before he could complete it. It was his life’s work, the Word made word, done to the glory of God. It’s a challenge to us to make our lives count for more than ourselves, and a reminder that dedication and single-mindedness can help you achieve something glorious. And that every brush stoke of our lives can be dedicated to God as a prayer, trusting in faith that something of it will survive for His glory. Two weeks ago we left off with Cuthbert, prior of Lindisfarne, taking a break from his rigorous duties and retiring from the world to live the life of a hermit on the Inner Farne Island, a few miles east of Lindisfarne. We’ll pick up the story from there…. The island of Inner Farne was deserted….or was it? Bede tells us that the first thing Cuthbert does is to banish some devils from the island who presumably had moved in once Aidan left, as the first Bishop of Lindisfarne had once used the Inner Farne as a place of retreat as well. Once the island is cleansed from evil spiritual influences, Cuthbert is now free to build his hermitage. The Inner Farne is one of a group of wild, windswept islands. Certainly Cuthbert got his wish to be free of human company, but even today the wildlife there is quite extensive, including over 100 species of seabirds (the Cuddy Duck among them) and myriads of seals. I imagine Cuthbert strode into this wild and rugged environment with a smile on his face, eager to begin his life of prayer and contemplation. The south end of Inner Farne. Cuthbert’s hermitage was on the north end. The white on the cliffs is from bird droppings! Today, many go to the Farne Islands for bird watching as it is one of the most famous sea bird sanctuaries in Britain, home to over 22 species of seabirds, including Cuthbert’s favourite Eider Duck and over 70,000 puffins! This map, from farne-islands.com, gives you a good view of the Farne Islands, and where they lie in comparison to Lindisfarne. The Inner Farne is the island on the very bottom, closest to the main land. You can also see that some of the islands join to make larger ones at low tide. For Cuthbert and the monks, the spiritual disciplines of prayers, fasting and communion with God were not to be taken lightly. They considered them labour, spiritual labour, whereby they were praying not only for themselves but for any and all concerns. Just as Cuthbert had fought against the Mercians as a soldier, he now took all the spiritual discipline he had learned as a monk and used it as spiritual warfare, conquering the devil’s temptations and standing against the work of the devil in the world through prayer, always seeking to draw closer and closer to Christ. Like the mighty Samson of old, he carefully abstained from every drink which could intoxicate; but was not able to abstain equally from food, lest his body might be thereby rendered less able to work: for he was of a robust frame and of unimpaired strength, and fit for any labour which he might be disposed to take in hand. The building is almost of a round form, from wall to wall about four or five poles in extent: the wall on the outside is higher than a man, but within, by excavating the rock, he made it much deeper, to prevent the eyes and the thoughts from wandering, that the mind might be wholly bent on heavenly things, and the pious inhabitant might behold nothing from his residence but the heavens above him. The wall was constructed, not of hewn stones or of brick and mortar, but of rough stones and turf, which had been taken out from the ground within. Some of them were so large that four men could hardly have lifted them, but Cuthbert himself, with angels helping him, had raised them up and placed them on the wall. There were two chambers in the house, one an oratory [a place for prayer], the other for domestic purposes. He finished the walls of them by digging round and cutting away the natural soil within and without, and formed the roof out of rough poles and straw. Moreover, at the landing-place of the island he built a large house, in which the brethren who visited him might be received and rest themselves, and not far from it there was a fountain of water or their use. Pretty impressive, huh? I find these details fascinating, especially considering Bede almost certainly visited this hermitage after Cuthbert’s death. Unfortunately nothing remains today of Cuthbert’s buildings. Although Cuthbert is alone on his island, he is not completely cut off from the world. The mention of the guest-house above gives you a clue. Cuthbert was visited regularly, firstly by the monks who would also bring him food and water. He would minister to them as well, in prayers and spiritual advice. There is a lovely mention in Bede’s account of how he would wash the monks’ feet, and they his, showing their mutual submission to one another, and to God. But Cuthbert’s fame as a holy man was spreading, and he began to get others coming to him for advice or blessings as well, including Elfleada, the daughter of King Oswald of Northumbria, who had taken over as Abbess of Whitby Abbey after Hild‘s death. He could not refuse this royal personage and met her on another island, further south from Inner Farne. As time went on Cuthbert decided he should grow his own food and not be dependant on the Lindisfarne brethren, so he plants some barley, reprimanding a flock of birds who come to eat it, who promptly depart, never to return. Cuthbert seems very content on his island, and withdraws even further from society, only interacting with people through a window he cuts in the wall of his hermitage. But in 684 AD his idyll comes to an end. He is elected in abstentia as Bishop of Hexham abbey at a synod, which comes as a great surprise to him and he refuses, even disregarding the tears and pleas of his fellow monks. It takes King Ecgfrith coming to his island to persuade him for him to finally relent, but only if he can swap with Eata and become Bishop of Lindisfarne instead, which they agree to. But his time as Bishop would be short. In 686 AD he returns to his island home, having been told by God that his time is near, and after two months becomes afflicted with some sort of sickness, possibly tuberculosis. On March 20, 687 he dies there, while at prayer in the oratory. He is accompanied by Herefrid, the abbot of Lindisfarne, who then tells the rest of the gathered monks outside who had been spending the night in prayer and watchfulness alongside their beloved Bishop. Immediately one of the monks ascended a hill with two lit candles, as they had agreed upon this signal as a means of telling the brethren at Lindisfarne the news, and the watching monk at the monastery hurried to tell the others. Cuthbert had previously agreed that he would be buried at Lindisfarne, and so the brethren bring his body back and inter him near the altar there. But his death was not the end of Cuthbert’s remarkable story. Many miracles continued to be reported by people who visited the monastery and his fame continued to grow. The first Anonymous Life of Cuthbert was written in the early 720s, and it is around this time that Bede wrote his poem about Cuthbert. …opening the tomb, found his body entire, as if he were still alive, and his joints were still flexible, as if he were not dead, but sleeping. His clothes, also, were still undecayed, and seemed to retain their original freshness and colour. When the brethren saw this, they were so astonished, that they could scarcely speak, or look on the miracle which lay before them, and they hardly knew what they were doing. 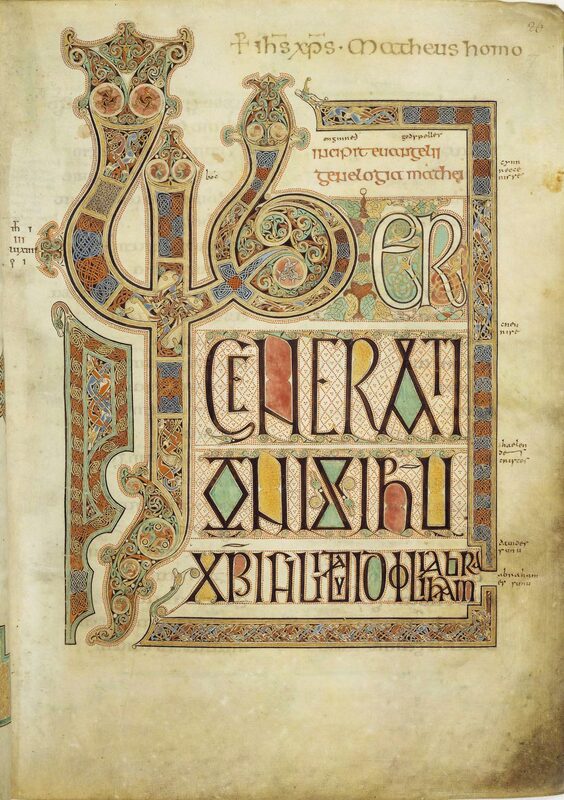 In homage to Cuthbert, and to God, Eadfrith, the Bishop of Lindisfarne, creates the Lindisfarne Gospels, one the greatest treasures of the Early Middle Ages (arguably one the greatest works of art ever produced). Cuthbert (now reburied in his new coffin) becomes a huge draw to pilgrims. Disaster strikes in 793 AD with the first Viking attack on a Christian church in England. The Vikings had first appeared in 789 AD, off the coast of Wessex, killing a king’s reeve. But the attack on Lindisfarne was different, as it struck at arguably one of the holiest places in Britain, desecrating the church with the blood of the monks, the church itself partially burnt down, the precious objects ransacked and taken away as treasure. Some of the monks were carted away as slaves. However, somehow the Gospels survived. * In the chaos of that day (and many more, for the church was attacked many times after that), the monks preserved this precious book, for which we owe them our eternal gratitude. But by 875 AD the monks had had enough. They fled Lindisfarne, taking with them what ever precious items they had, chief among them the Lindisfarne Gospels and the body of Cuthbert. They also had with them some of the bones of Aidan (the rest buried at Lindisfarne), and the head of Oswald, the great king (and saint in his own right by this point). They wandered about Northumbria, settling here and there and getting driven out again and again by the maurading Danes, but always taking their relics and the marvellous book with them. The monks were no milquetoasts, though. At the prompting in a vision from Cuthbert himself, they were involved in a bloodless coup by saving the young Dane Guthred from slavery who ended up deposing the current Viking leader of Crayke, near York. Finally after seven years of wandering they settled at the old Roman town of Chester-le-Street, and built a monastery, staying there for a hundred years. But in 995 AD the Danes were threatening again so off they went, carting their book, the relics, and Cuthbert, and went to Ripon. When things settled down they started back, but on the way the wagon carrying the heavy coffin became stuck on the road, and the monks took this as a sign that this was where the saint wanted to be laid to rest (maybe the poor monks were exhausted, too.). I love this sculpture, located in Durham, which commemorates the journeys of the Lindisfarne monks as they travelled across Northumbria. The site was Durham, and here they built a church and monastery, replaced by a cathedral after the Norman invasion. Cuthbert’s fame was at its peak at this point, and they wanted a church worthy of the great saint. However, people were skeptical of the story of the incorrupt body and so, before he was interred by the altar, the monks opened the coffin again and found the body still preserved inside. The coffin was placed in a beautiful shrine and visited by a great many pilgrims. Alas, during the dissolution of the monasteries by Henry the VIII , the shrine was dismantled and the coffin reburied (not after opening it and once again finding the body complete!). This beautiful pectoral cross was found in the folds of Cuthbert’s vestments when his coffin was opened in 1827. It almost certainly belonged to Cuthbert himself, and he would have worn it around his neck. When Henry VIII’s reformers plundered the monasteries and opened Cuthbert’s coffin, looking for treasure, they missed this little cross, because it was hidden. Thankfully! In 1827 the coffin was opened one last time, and a skeleton was found (darn). A post-mortem was done and the doctor said the bones were consistent with everything they knew about Cuthbert. He was laid to rest the final time in Durham Cathedral, where you can still visit his tomb today. The final resting place of Cuthbert is in Durham Cathedral, interred under the marble slab bearing his name. Behind the tomb is damaged statue of Cuthbert (ironically without at head), holding Oswald’s head, an object of veneration in its own right and which made the long journey with Cuthbert along with some of Aidan’s bones. Durham is a definite must-see for my next trip to Britain. Bede is also buried there, in a separate tomb! ….Or can you? There is a legend that before Henry’s agents could come and destroy the church and presumably Cuthbert’s coffin, the monks opened the coffin and replaced Cuthbert’s body with that of a recently deceased brother monk. They spirited Cuthbert’s body away and buried it in a secret location in the grounds of Crayke Abbey. The location was only known to twelve monks, revealed to another only when one of the twelve dies. So ended the life and travels of Cuthbert. 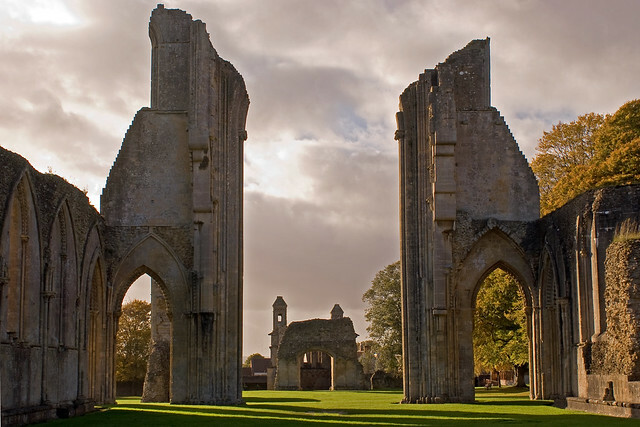 It is said that with all the travelling he did as a monk and the journeys he took after death with his fellow monks, that he was one of the most well-travelled people of Britain at the time. There is some dispute about the exact route, but after they left Lindisfarne the monks travelled between five hundred and a thousand miles before settling in Durham! Cuthbert had a remarkable life, and a remarkable death. No wonder he is still celebrated today! * Click here to read a fascinating article about a new display in Durham Cathedral of that coffin and some of the objects found in it. **It weighs close to eighteen pounds, and due to its size, would have probably taken two people to carry.